I can't believe the weather at the mo, it is lovely again here in Derbyshire. I have been asked if I would share the Guitar WPC cutting file so here is a link for it. You can see a pic of it in yesterdays posting. The Files I have made as free downloads are copy righted I have given permission for you to use for your own personal use only. please enjoy. It is a lovely day here in Derbyshire. I haven't made any new cards but I want to show you a few I made before I started this blog, useing my Pazzles Inspiration Cutter. to the cut out letters. The teddy was from some die cut decoupage I had. This card was also cut with the Pazzles, this time I cut the card with the name down one side and then cut the letters out of DCWV card stock then with sticky pads positioned the letters in place . I love making the name of the recipient the feacher of the card. This time I made my own embelisment using the Pazzles again. I down loaded an image of a giutar from the internet and used the software that comes with the machine to make the shapes needed tho make the embelishment. I really enjoy the fact that I can make these things myself. This next card was also made with the pazzles again I made a feacher of the name. made the same way as the card with Mummy on it. This last card also made using the Pazzles but this time I used the pen tool to make my own back ground for the letters that had been cut out. The wording near the bottom of the card was also done with the pen tool. I hope you have enjoyed looking at these cards. Hasn't it been a lovely afternoon, the sun has been shinning here in Derbyshire for a change. Well I have been playing with the Pazzles Inspiration again. This time I have made a stencil so I can do some embossing, you can emboss with the the Pazzles but I wanted a stencil for the project I had in mind. The stencil material I used was Cricut Stencil Material . I was very pleased with the result. Let me know what you think. 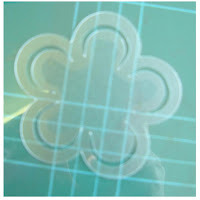 Klick on the photo and you will be able to see the embossing on the first layer of the flower embelishment. The second photo, is of the stencil I made with the Pazzles. Cricut Stencil Material has a repostionable sticky on one side, I found this very useful, no more hunting for the masking tape. Phew... I have just worked out how to get more than one photo in a posting. Well I hope you like what you see. This card was made with the same technique as the cat fish Birthday card. It is a really quick card to make and would make a lovely Get well soon card for some one in hospital, because as I found when my Mum went into hospital recently we couldn't take her a bunch of flowers. 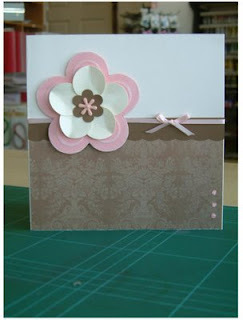 Here is a card that we did in the craft class on Saturday. The Girls had a lot of fun with this card. I cut the aperture out on the Pazzles in the shape of a goldfish bowl. Place a plastic zip bag with hair gel in it and the air squeezed out behind the aperture. On a separate sheet of card, use a stamped image or as we did in this case we drew our own scean we used a fish peeloff on coloured paper and with sticky fixes put it in our fishbowl. The Cat was made up from circle and heart punches. We used a chalk stamp pad to colour the elements of the cat. I used peeloffs to add the greeting to the finished card. Hi, to any one that may be reading this. I have never blogged before, so this is a new experience for me. As we go I will be adding cards I have made. I will also be posting some tutorials for the Pazzles Inspiration Cutter and showing some samples of what can be created with this machine. This is a short post for now. I am going to see about getting the look for the blog.